I wanted the bed to remain the focal point of the room, so I was hesitant on hanging any artwork around it to compete. My mom is a wallpaper guru and she hung it (perfectly) last summer when she was staying at our house. My daughter (Summer, 3) loves it and she'll count the little pink and blue french chairs on it. All the other furniture has basically stayed the same. 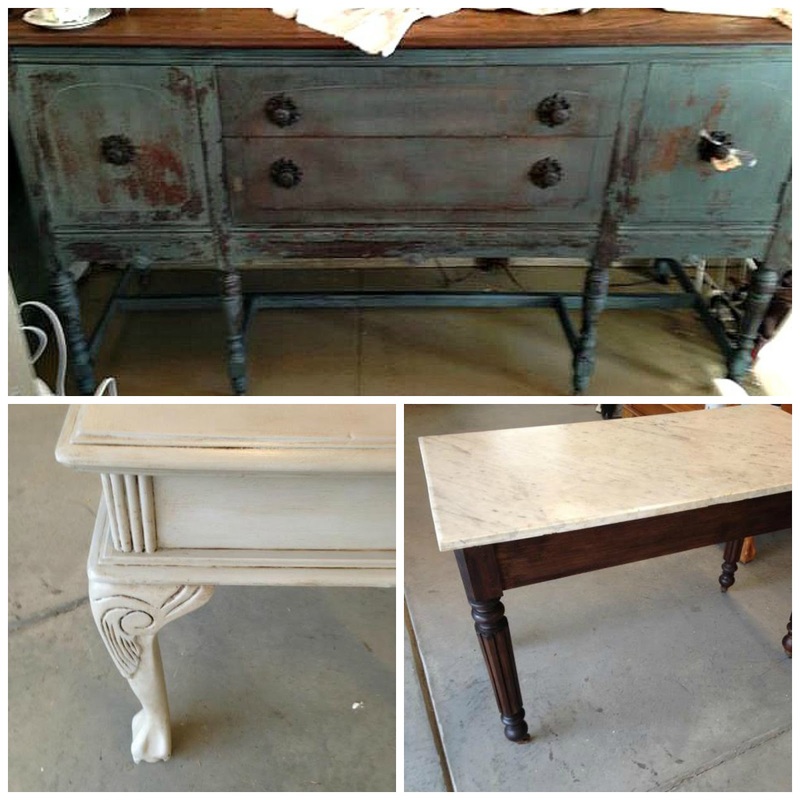 Summer uses this little flea market table that I re-painted last year all the time! She'll sit and color or read books here for a while. It's hard to believe that I only have a little more time with her before she's off to school like her big sisters. I didn't decorate much for Easter this year, but Summer and I put together this little egg tree for her room a few weeks ago. I think she thought there was chocolate inside as I later noticed some teeth marks on one! I've been "spring cleaning" in the garage and trying to thin it out, so there have been some great deals for customers lately. Don't forget to follow my Facebook page (here) where I've been posting some furniture/booth updates. I've also been deep cleaning my house inside and out because of a big event next week...stayed tuned for that. A room for a princess for sure. I love the bed and I do like the wall paper too. Please stop by my blog and join me to rad about Missouri Farm Life and lots more. that bed deserves to to be the center of attention!! such a precious room, have a wonderful Easter weekend! Love the curtains, Kristen, and the wallpaper is gorgeous. Nice updates! The curtains do make a HUGE difference in a room and I love the ones you have here. Hope you and your family have a wonderful EASTER!!! Is the big event what I think it is? what wonderful memories she'll have of the love you put in her room. The bed is so adorable and perfect for a little girls room. Lovely wallpaper too! Such a beautiful room! I don't like wallpaper normally, but your choice behind that gorgeous is just perfect. Oh that room is gorgeous Kristen...always loved seeing that gorgeous bed...and hey, what's your mom doing in her "spare time" ... I have a powder room that needs wallpapering!...She did a fabulous job! !....I am sure that your booth is keeping you busy as your beautiful pieces do not last long before someone gives it a good home!...you have got my curiosity going...big event?...can't wait to hear what that is...! !..May I guess?!! Happy Easter to you and your family Kristen!!! Just yesterday I was telling my husband how much I LIKE wallpaper! It made all the difference in your daughter's room, too. I LOVE IT!! Like, seriously LOVE it. And wherever did you find the settee? It's perfect. I adore that bedroom--that bed is so pretty. The whole room looks perfectly magical. This is such a sweet room, Kristen. And that wallpaper is the perfect compliment to the bed without taking away from the beauty of it. This sweet bedroom looked very pretty before. The added touches(I especially like those ruffled curtains)were a great finish to the room. What a great room for your little one to grow in, as it isn't just for "little" girls. Love the curtains, bed, wallpaper...love it all! Hi there, Happy Easter! Im a new reader to your blog and I am really enjoying it!.. 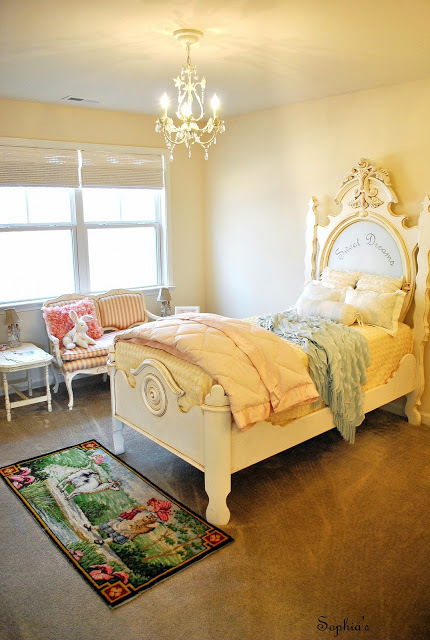 Your daughters room is beautiful and that bed is simply gorgeous!! Still such a darling room!